...Our goal is to continue to evolve with exciting benefits through strategic partnerships that attract new members and add tremendous value to vacation ownership. 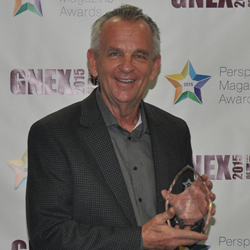 staySky® Vacation Clubs was named the global timeshare industry’s Best Newcomer at the 2015 Perspective Magazine Awards celebration, Feb. 17, at 2015 GNEX Conference in San Diego, Calif. Judges had high praise for this program that reinvents the vacation membership model with a fresh take on creating memories to last a lifetime. The presentation of one of the industry’s highest honors took place on the final night of the conference during a gala aboard the legendary USS Midway Navy aircraft carrier, now serving as a museum in the San Diego Bay. Winners were announced before senior-level industry executives from more than 115 companies across the globe. Receiving the award on behalf of staySky Vacation Clubs, vice president Jack Chevrier said, “It is an honor to be recognized by our peers. This award is a testament to the hard work and dedication of our staff, who went above and beyond to launch and grow our innovative program in record time. Launched in 2014, the staySky Vacation Clubs brand was designed by veteran timeshare executives who saw the opportunity to create a new kind of members-based program in tune with the changing economy and emerging travel trends. The new Vacation Club is a points-based product that complements staySky’s core resort business. It features four properties, each in the heart of Orlando’s thriving tourism corridor. One property, Lake Buena Vista Resort Village & Spa, ranked among TripAdvisor’s 2014 list of Top 10 Hotels for Families in the United States. Ideal for families, business travelers and friends, the portfolio also includes: Hawthorn Suites Lake Buena Vista, staySky Suites-I Drive Orlando and Enclave Suites. In keeping with its customer-centric approach, staySky Vacation Clubs extends its benefits across a vast network of resort properties through its partnership with Interval International. This association enables staySky members to vacation at more than 3,000 resort properties across the globe. To further enhance the experience, the brand created the staySky Escapes program, offering extended vacation packages, dining certificates and hotel stays at more than 185,000 properties. Also part of this program are unique offers for cruises and private yacht and sailboat excursions. Additionally, members can spend Reward Credits on accommodation upgrades, car rentals, attraction tickets, culinary experiences, tours, gift cards, and a wine club membership. Adding to the program’s flexibility, staySky members can opt for long or short stays that fit their schedule, not according to a period set by the vacation provider. This is one of the many features that shifts control to the member for increased membership satisfaction. As a “newcomer,” staySky Vacation Clubs has quickly secured its place in the competitive Orlando vacation ownership market. The program is reaping the rewards of strong member engagement and continuing to attract new members. Consistently superior reviews and high satisfaction ratings provide further validation that this new kind of vacation club is attuned to travelers evolving tastes and lifestyles. The annual Perspective Magazine Awards is an international competition recognizing the top companies and individuals in the timeshare and fractional sector of the hospitality industry. One of the industry’s highest honors, the award uniquely combines a panel of four judges with a public online vote to select winners in 32 categories. Each judge represents 20 percent of each nominee’s overall score, with the public vote accounting for the remaining 20 percent and representing a fifth wildcard judge. Winners receive elegant crystal trophies and a customized Perspective Magazine Awards logo to use in their marketing collateral, websites and brochures. They also earn their place in the Perspective Magazine Awards Hall of Fame.